This sweater is knitted but the material is very light and breathable. As you can see it has slits on both sides and a cut out on the back (sorry forgot to picture that). This is great for winter, you can wear a tank under it in case it is too cold or a jacket over it since it is not too thick. It is also a great transition piece for Spring. The slits and the cut out make it a little more light weight but the long sleeve and knit make it warmer for the chilly days. I really love the color and that’s what sold me on it. Unfortunately it is sold out for now but there are many similar ones. These jeans are very comfortable, I am back to my normal size! I lost all pregnancy weight except for 5 pounds which is perfect. I was hoping I would keep at least 10 pounds but 5 will be fine for now. Anyways, the jeans are very flattering and fit true to size. I love the wash and distress look on them. 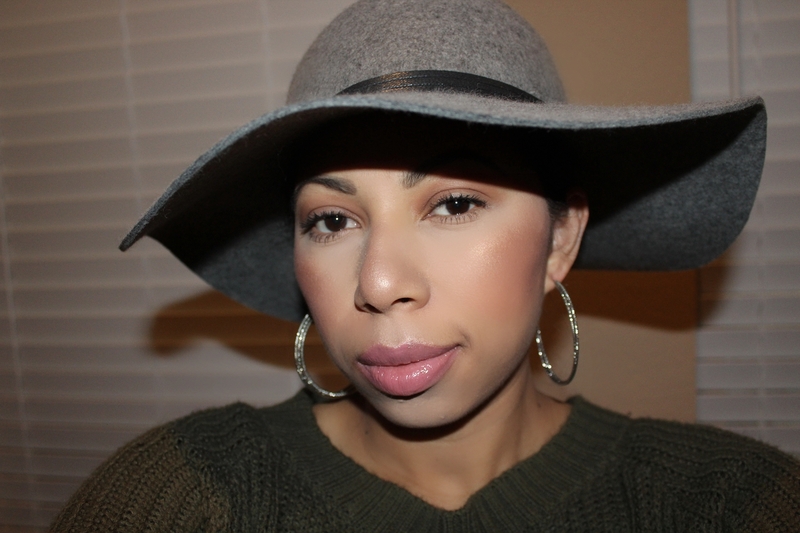 The hat is from Nordstrom and is perfect for this cold weather. Wool is always a good option in the fall and winter. Not sure how much longer I will be able to wear it but here in Texas the weather can be crazy. I guess it’s possible for some of Spring to still be cold. Shoes, these are very comfortable and were a great find at TjMaxx. I am almost positive I paid about $20 for them which is a steal! Only bad thing about those stores is that you have to get the item when you see it, once its gone then it really is gone. I really liked the color on them and figured they would pair perfect with jeans. I was right! The earrings are just hoops I purchased from Charlotte Russe. The last couple of days have been cold, rainy and gloomy here in Texas. This outfit has been great to keep me warm. Does not look like sunshine is in our forecast so sweaters it is for now. Hope you guys enjoyed this look of the day. Let me know if you have any questions regarding any of the items. Hope you had a great Friday and enjoy your weekend!